I can’t recommend talking fly enough!! They were the videographers at our wedding in August and not only are they such lovely people but are so so talented. Our wedding trailer has brought tears to all our family and friends, it is so beautifully done and encompasses us perfectly. The full video is such an amazing memory and we will treasure it forever. Thank you so much Ryan and Carrie for being fantastic!! We used Talking Fly Wedding videographers to capture the magical moments of our special wedding day and they did us proud. They captured everything without being intrusive and produced an amazing trailer and full length wedding video.Ryan and Carrie were very professional and it was a pleasure to have them with us all day filming unforgettable moments. Ryan & Carrie we’re an absolute dream to work with leading up to our wedding and on the day, most of the time we didn’t realise they were there and they created an amazing high quality video and trailer that captured our special day perfectly. Memories we will cherish forever. I can’t recommend them enough. Ryan, Carrie and team are exceptional! Professional, fun and a lovely bunch! Our wedding clip is just the best thing ever! We would definitely recommend and use them ourselves again if the occasion calls for it! You never noticed their presence but they managed to capture every special moment?! How did you guys do that!! Amazing! Very best of luck in the future talkingfly! Ryan & Carrie were an absolute dream to work with leading up to our wedding and on the day, most of the time we didn’t realise they were there and they created an amazing high quality video and trailer that captured our special day perfectly. Memories we will cherish forever. I can’t recommend them enough. Absolutely amazing! We were contemplating getting our wedding videoed for ages and when we read previous reviews about Talking Fly we decided we’d to go for it… And I’m so glad we did. We couldn’t of been happier with the whole process. Ryan and the guys are fantastic. Really friendly and made us feel comfortable the whole time. We barely even noticed they were there!! They were really fast with getting our trailer done which was amazing, everybody loved it. And then the extended edit was awesome. It’s so great to be able to relive our special day. I’m so glad we got it videoed and I’d recommend talking fly to everyone! I can safely say without a shadow of a doubt that having Talking Fly at our wedding was one of the best decisions we have ever made. If you are thinking whether or not you should have a videographer at your wedding, definitely have one, and DEFINITELY make sure it is Talking Fly. We spent countless hours trying to find the right videographer but everything we saw from other people looked like 1990’s old camcorder recordings filmed by an uncle. The second we saw Talking Fly’s work we fell in love with them immediately and it was one of the easiest and by far the best decision throughout the whole wedding process! Ryan and his sister Carrie are 2 of the nicest, sweetest and funniest people you will ever meet. Ryan was so professional and helpful, right from our first enquiry email all the way through past the finished masterpiece. They were not intrusive during any of the wedding proceedings and in fact (sadly!) didn’t notice they were even there most of the time! However when any of our guests did interact with Ryan and Carrie they said they were 2 of the nicest people they’d met, and indeed did not feel like “the videographers” at our wedding, but much more like part of our wedding guests! I honestly don’t know how they did it so discretely, but the finished product is an absolute cinematic masterpiece! They somehow managed to catch each and every magical moment of our wedding and thanks to Talking Fly we will be able to re-live our day for the rest of our lives. Every single second of the day is captured, from the bride and groom individually getting ready early in the morning, right through to the evening dance floor seeing you into the night. Their style is indeed truly cinematic and you feel like you’re watching yourself in a movie. Different angles, ultra high quality, smooth editing, all come together to form a warm and heart filling motion picture. The cinematic trailer created (with the music of your choice) on its own is worth every single penny. It is so beautifully created that each time we watch it we feel the same emotions of our wedding day as it was captured so perfectly (just look at the trailers on their website and they speak for themselves). And just when you think you’ve seen the best, the extended wedding video truly is magical, catching every little detail you (or the bride!) has worked so hard on. What tops it off at the end is the heartfelt and hilarious GuestCam to end on a high! Every wedding has a photographer, and after discovering Talking Fly, EVERY wedding should have them as a videographer. With Talking Fly there are no worries or stresses involved, once you book them all you have to do is sit back, relax, enjoy your wedding day, and just wait for the cinematic masterpiece to come through. We went on our Honeymoon the next day and the finished product was completed and ready to watch (online HD) while we were still away, which made the honeymoon all that more special! You have a USB, DVD, BluRay, you name it, all sent beautifully packaged with all the trimmings! An old university friend also (randomly!) had Talking Fly at their wedding and had the same magnificent experience, proving their consistency. Every single one of our family and friends love the video and keep watching it over! I honestly can’t stress enough how amazing they were. If you want one less thing to worry about during your wedding, book Talking Fly! WOW – Ryan!! We are completely blown away with how amazing our highlight video is! We can’t wait to see the whole thing now!! Ryan and his team were amazing from start to finish, he was there capturing every second of our wedding but not getting in the way or standing out to our guests! Thank you for allowing us to remember every second of our day!!! Our wedding was full of talented performances which would not have been captured by still camera so we needed a film maker and Ryan joined us as the most talented performer of all. At our initial meeting when I presented him with our ‘script’ and our quirky venue, he was charming, professional and totally on board with everything we had planned. We felt completely confident he was the man for the job and his talent and amazing eye for detail was proved on the fabulous highlight video that was available so quickly after the big day, allowing us to share with friends and family who didn’t make it So much better than visiting everyone afterwards with huge albums of endless photos. We now have our full length film which is just as fantastic and allows us to see all the ‘backstage’ footage as well as the special bits. Ryan, we love you for giving us a lifetime visual memory and implore that everyone reading this who knows someone who has a special event coming to book Talking Fly now !! 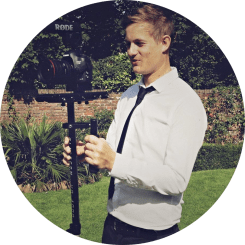 Being keen to book someone local, we found Ryan online – after meeting him, we had every confidence he would do a sterling job – and boy was I right! On the day, Ryan was courteous, sensitive, interested and went to every effort to make sure he had got what he needed. His attention to detail is outstanding and I am so proud to show people my video. A genuinely kind and all round nice guy, you won’t go wrong booking him for your wedding. Just watch one of his videos and see… Thanks again Ryan, you are just awesome! Well its a year to this day that Ryan videoed our wedding. He captured every moving moment, watching the video brings back so many wonderful memories that I will never forget. I was someone who felt a bit nervous being videoed all day but he made me feel at ease as I hardly knew he was there. I would highly recommend such a fantastic and artistic videographer. I know a lot of my friends have hired him after seeing my highlights video and they would recommend him just as highly!! How many hours would you like us for? Increasing the hours of coverage allows us to capture more footage and produce a richer video. The events we capture will depend on the schedule you have set for your day so please ensure you select adequate amount of coverage. Use one of our lightweight video cameras to film the build-up to your wedding day yourselves and we’ll edit the footage into your video. We’ll send you the camera two days before your big day. A fully equipped station for your guests to leave you messages. Set up in a corner at your reception, this self contained recording and display unit is sure to be a hit – have a look at the sample video below! Add the ultimate cinematic footage into your trailer. We’ll use our drone to VERY discreetly capture setting the scene shots of your venue. The drone will not be flown within the proximately of guests. You’ll need to check your venue allows the use of drones. If the drone cannot be used due to hostile weather conditions, any money paid for the drone will be refunded. 3-5 minute video including all of your “best bits” – this video is perfect for sharing on social media or for reminiscing and re-living all of your big day within a few minutes. 1-2 hour video with footage of all the events captured on the day; including bridal preparation, full ceremony, full speeches, cake cutting, first dance, evening celebrations (all items coverage time dependent). This edit includes audio as recorded on the day and no additional sound tracks. Both the ceremony and the speeches are filmed continuously with no gaps, pauses or breaks. 1 minute video set to your choice of music, with all your “best bits”. *At least 9 hours coverage required to select this edit. Up to 20 minute video set to four pieces of music. With all your “best bits”, typically including small amount of bridal preparation, vows / personal promises, small amount of speeches, cake cutting, first dance, evening celebrations (all items coverage time dependent). How quickly would you like your video to be ready after the wedding? We offer special discounts for our favourite venues – see if your venue is listed below. Please tick to consent to your data being stored by Talking Fly. Too expensive? Check out our sister company One in Six Billion for a more budget friendly option. Just like each of our couples – we know every wedding is different. Our quotation form can be used to put together a bespoke package that suits your individual requirements. 1 – Pick and choose what you’d like from your wedding video. 2 – Click the Next button and complete the details. 3 – We’ll get back to you with availability and deposit information. Absolutely amazing! We were contemplating getting our wedding videoed for ages and when we read previous reviews about Talking Fly we decided we'd to go for it... And I'm so glad we did. We couldn't of been happier with the whole process. Ryan and the guys are fantastic. Really friendly and made us feel comfortable the whole time. We barely even noticed they were there!! They were really fast with getting our trailer done which was amazing, everybody loved it. And then the extended edit was awesome. It's so great to be able to relive our special day. I'm so glad we got it videoed and I'd recommend talking fly to everyone! I can safely say without a shadow of a doubt that having Talking Fly at our wedding was one of the best decisions we have ever made. If you are thinking whether or not you should have a videographer at your wedding, definitely have one, and DEFINITELY make sure it is Talking Fly. We spent countless hours trying to find the right videographer but everything we saw from other people looked like 1990's old camcorder recordings filmed by an uncle. The second we saw Talking Fly's work we fell in love with them immediately and it was one of the easiest and by far the best decision throughout the whole wedding process! Ryan and his sister Carrie are 2 of the nicest, sweetest and funniest people you will ever meet. Ryan was so professional and helpful, right from our first enquiry email all the way through past the finished masterpiece. They were not intrusive during any of the wedding proceedings and in fact (sadly!) didn't notice they were even there most of the time! However when any of our guests did interact with Ryan and Carrie they said they were 2 of the nicest people they'd met, and indeed did not feel like "the videographers" at our wedding, but much more like part of our wedding guests! I honestly don't know how they did it so discretely, but the finished product is an absolute cinematic masterpiece! They somehow managed to catch each and every magical moment of our wedding and thanks to Talking Fly we will be able to re-live our day for the rest of our lives. Every single second of the day is captured, from the bride and groom individually getting ready early in the morning, right through to the evening dance floor seeing you into the night. Their style is indeed truly cinematic and you feel like you're watching yourself in a movie. Different angles, ultra high quality, smooth editing, all come together to form a warm and heart filling motion picture. The cinematic trailer created (with the music of your choice) on its own is worth every single penny. It is so beautifully created that each time we watch it we feel the same emotions of our wedding day as it was captured so perfectly (just look at the trailers on their website and they speak for themselves). And just when you think you've seen the best, the extended wedding video truly is magical, catching every little detail you (or the bride!) has worked so hard on. What tops it off at the end is the heartfelt and hilarious GuestCam to end on a high! Every wedding has a photographer, and after discovering Talking Fly, EVERY wedding should have them as a videographer. With Talking Fly there are no worries or stresses involved, once you book them all you have to do is sit back, relax, enjoy your wedding day, and just wait for the cinematic masterpiece to come through. We went on our Honeymoon the next day and the finished product was completed and ready to watch (online HD) while we were still away, which made the honeymoon all that more special! You have a USB, DVD, BluRay, you name it, all sent beautifully packaged with all the trimmings! An old university friend also (randomly!) had Talking Fly at their wedding and had the same magnificent experience, proving their consistency. Every single one of our family and friends love the video and keep watching it over! I honestly can't stress enough how amazing they were. If you want one less thing to worry about during your wedding, book Talking Fly! WOW - Ryan!! We are completely blown away with how amazing our highlight video is! We can't wait to see the whole thing now!! Ryan and his team were amazing from start to finish, he was there capturing every second of our wedding but not getting in the way or standing out to our guests! Thank you for allowing us to remember every second of our day!!! Our wedding was full of talented performances which would not have been captured by still camera so we needed a film maker and Ryan joined us as the most talented performer of all. At our initial meeting when I presented him with our 'script' and our quirky venue, he was charming, professional and totally on board with everything we had planned. We felt completely confident he was the man for the job and his talent and amazing eye for detail was proved on the fabulous highlight video that was available so quickly after the big day, allowing us to share with friends and family who didn't make it So much better than visiting everyone afterwards with huge albums of endless photos. We now have our full length film which is just as fantastic and allows us to see all the 'backstage' footage as well as the special bits. Ryan, we love you for giving us a lifetime visual memory and implore that everyone reading this who knows someone who has a special event coming to book Talking Fly now !! Being keen to book someone local, we found Ryan online - after meeting him, we had every confidence he would do a sterling job - and boy was I right! On the day, Ryan was courteous, sensitive, interested and went to every effort to make sure he had got what he needed. His attention to detail is outstanding and I am so proud to show people my video. A genuinely kind and all round nice guy, you won't go wrong booking him for your wedding. Just watch one of his videos and see... Thanks again Ryan, you are just awesome! Creative Director and Lead Videographer, I started Talking Fly in 2012 chasing my dream to be self-sufficient and escape the 9-5 desk job. I enjoy exercising my creative license and am always in search of that perfect shot. I specialise in Glidecam and post-production. Assistant Videographer and original bag holding lady (quite literally). I started Talking Fly in 2014 to lend a helping hand to my older brother, the main man Ryan. I’m not sure at which point I agreed to take on the job professionally but over 100 weddings later – here I am. Assistant and Lead Videographer! I joined Talking Fly in 2018, helping with the summer weekday weddings. I’ve always enjoyed filming as a hobby and have loved learning lots of new techniques with Talking Fly. I specialise in DJI Ronin and post-production.